Both signed and dated 1807. 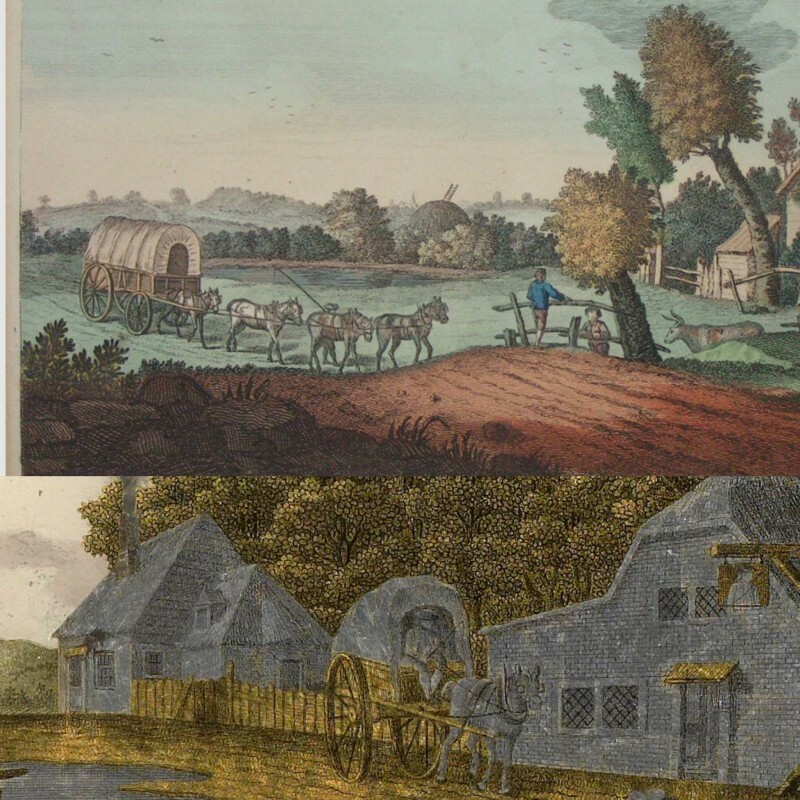 English scenes derived from a set of engravings called Views in Kent and Surrey (1770) after John Cleveley. Oil and etched gold and silver leaf on glass, 11½" x 16½" (29cm x 42cm). Over frames, 14½" x 19½" (37cm x 49.5cm). 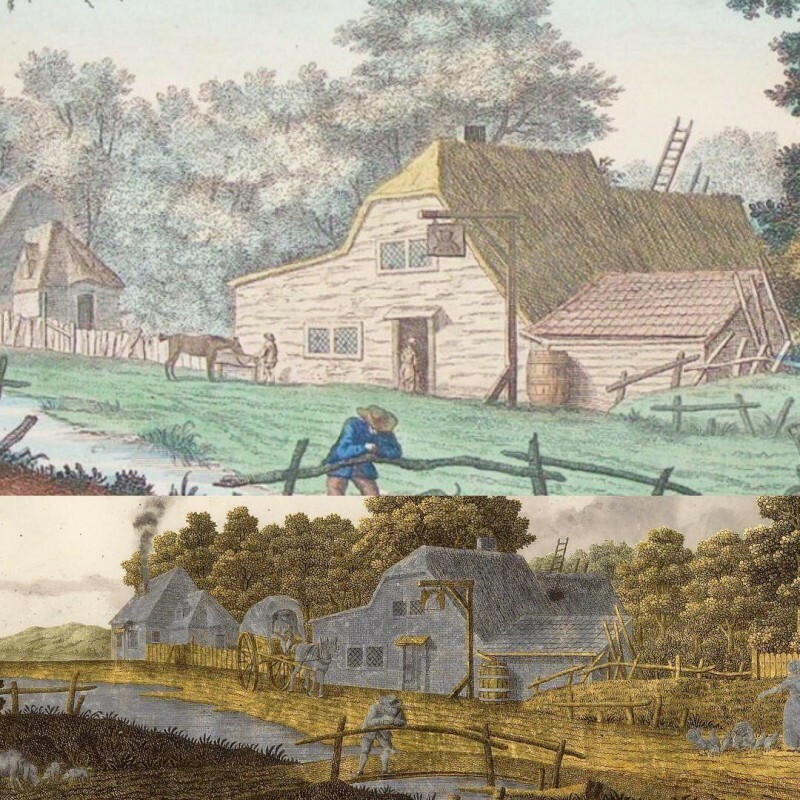 Jonas Zeuner was born in Kassel and moved to Amsterdam in 1750, where he lived for the rest of his life. 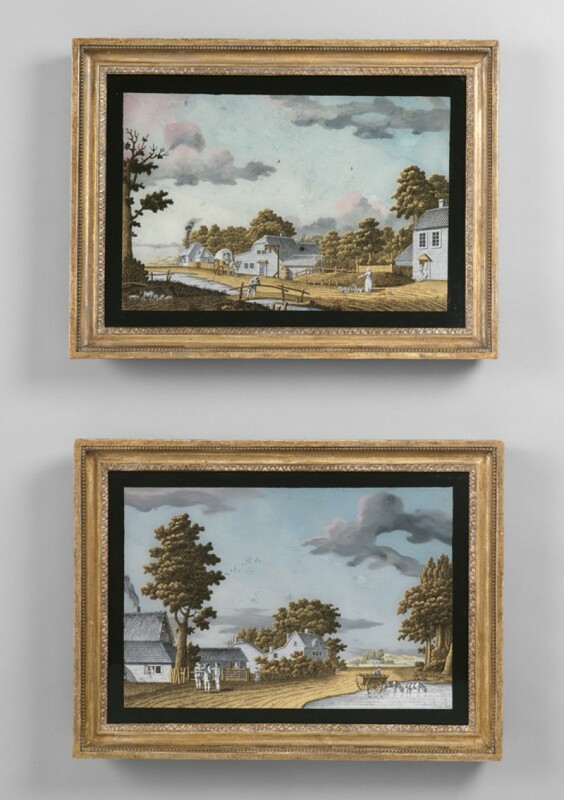 About 170 paintings by him are known, in this distinctive technique of a combination of oil paint and engraved gold and silver leaf on glass, and examples are in various museum collections, including those of the Rijksmuseum, Amsterdam and the Corning Museum of Glass, Corning, New York. 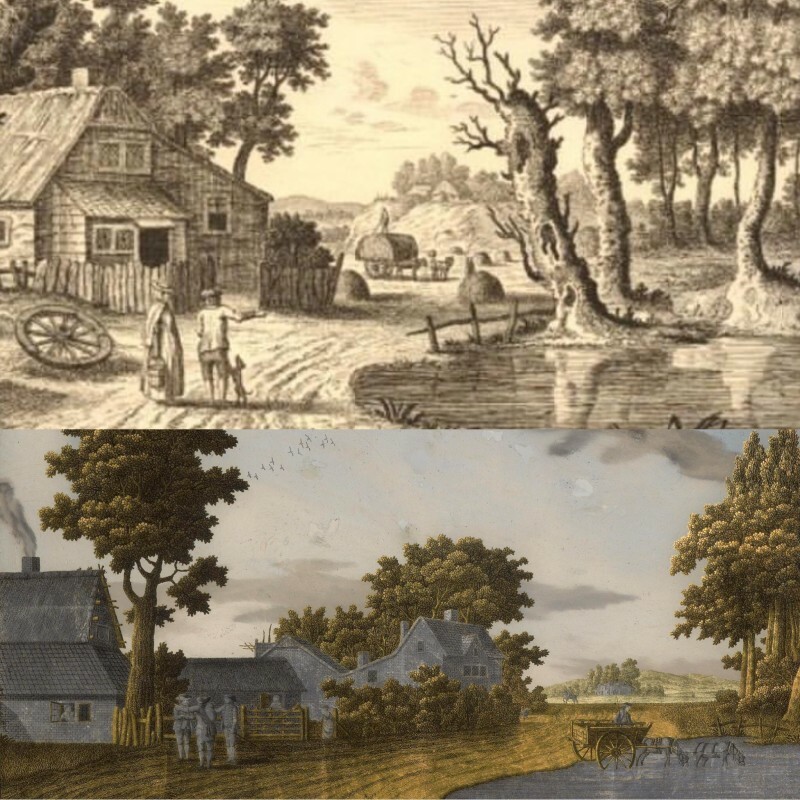 These present pictures are very similar to another pair of pictures by Zeuner, of exactly the same size, in the Victoria & Albert Museum, of Bradfield Mill, Berkshire and a Cottage scene near Colchester, Essex (1). 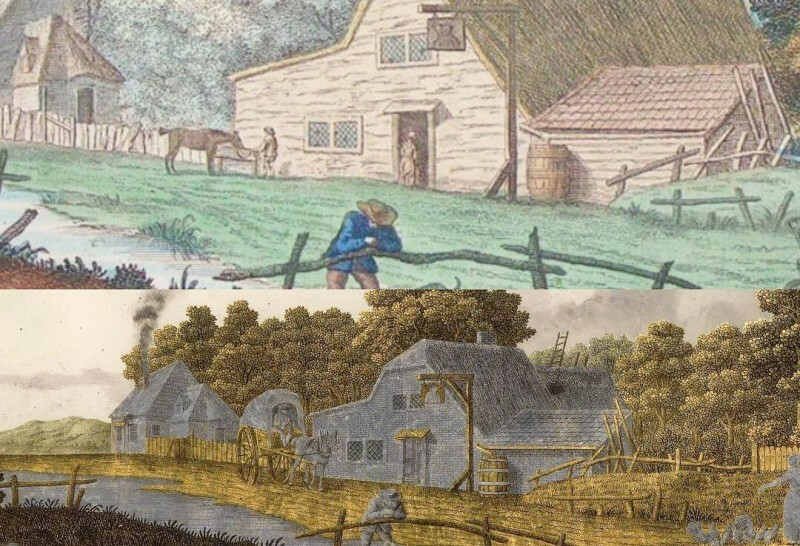 Zeuner is said to have been in England at least between 1802 and 1806, and is known to have produced a number of pictures of English landscapes and city scenes, though whether from direct observation or from engravings is not clear. 1. See J. Sprenkels-ten Horn and A. Sprenkels, Jonas Zeuner (1727-1814), Zijn wereld weerspiegeld in zilver en goud, the catalogue of an exhibition at the Amsterdam Historical Museum, 1994, nos. 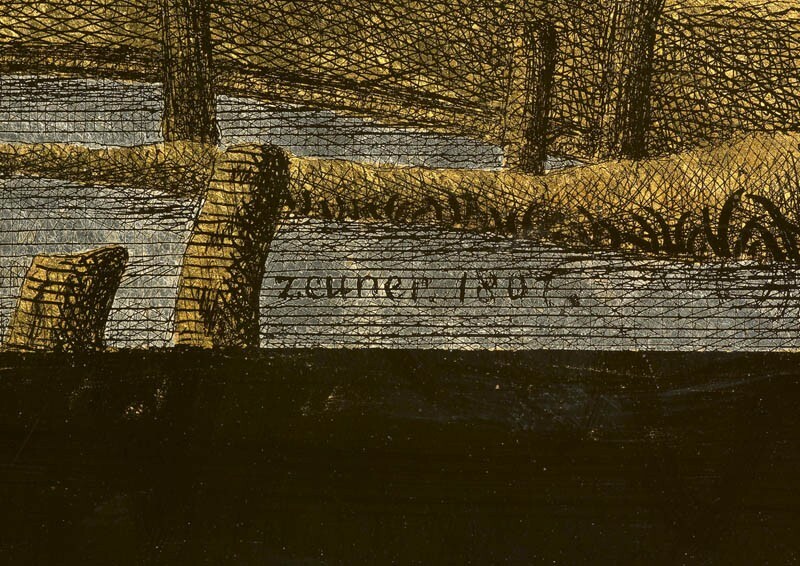 157 & 158, p. 73. 2. Sotheby's, Amsterdam, 27th March 2001, lot 85 (€82,000). 3. See for example, a picture of an Amsterdam house on Keizersgracht, sold Christie's Amsterdam, 27th June 2001, lot 226 (61,307). 4. For example, Christie's London, English Furniture, 19th November 1987, lot 12 (£16,500). 5. International Art Treasures Exhibition, Bath, BADA & CINOA, 1973, pl. 246. Exhibited by Ayer & Co. (Antiques) Ltd., London. 6. Christie's London, English Furniture, 24th April 1980, lot 90 (£5,500); and again, Christie's London, European Furniture, Sculpture, Tapestries & Carpets, 12th June 2003 (£26,290). 67 Jermyn Street, London SW1Y 6NY, UK.